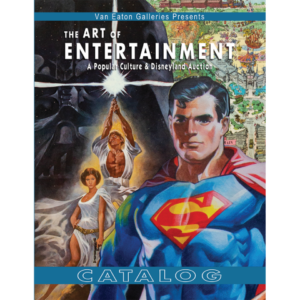 Van Eaton Galleries is having an auction on May 4, 2019 with all kinds of goodies for movie fans and collectors. This collection brings together original artwork, props, artifacts, and historical items from memorable moments of Popular Culture and Disneyland history. Highlights of this collection include original Drew Struzan artwork from the “Back to the Future” trilogy, original Charles Addams artwork from “Murder by Death”, two wooden Nautilus models used in the creation of “20,000 Leagues Under the Sea”, as well as items from “Star Wars”, “The Simpsons”, “Star Trek”, “E.T.”, “Spaceballs”, “Mary Poppins”, and the over 60-year history of Disneyland. Previous PostPrevious Tonight I’ll be on Behind the Scenes — Listen In!